The Russian Soyuz TMA-03M backs away from the International Space Station after undocking to return three members of the Expedition 31 crew to Earth on July 1, 2012, in this still from a NASA broadcast. This story was updated at 1:23 a.m. ET. Next stop: Earth. Three astronauts cast off from the International Space Station early Sunday (July 1) to begin the journey home aboard a Soyuz space capsule as they wrap up a months-long stay at the orbiting outpost. NASA astronaut Don Pettit, Russian cosmonaut Oleg Kononenko and European Space Agency astronaut Andre Kuipers spent more than six months on the space station as part of their long-duration Expedition 31 mission. Their Russian-built Soyuz capsule undocked from the space station just a few seconds before 12:48 a.m. EDT (0448 GMT) as the two spacecraft flew 250 miles (402 kilometers) over China. The Soyuz is expected to land at 4:14 a.m. EDT (0814 GMT) on the Central Asian steppes of Kazakhstan. As it backed away from the space station, Kononenko tested a new digital autopilot system for the Soyuz, NASA officials said. 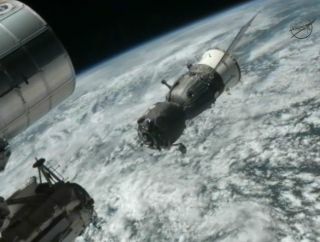 Cameras on the space station beamed back spectacular video of the Soyuz's undocking and departure. Expedition 31 commander Oleg Kononenko of Russia (top), Dutch astronaut Andrew Kuipers (center) and NASA astronaut Don Pettit bid farewell to their crewmates on the International Space Station just before shutting the hatches between their Soyuz and the station for a July 1, 2012, return to Earth. Throughout their mission, Pettit and Kuipers actively shared their space experiences with the public through Twitter, photos and blog posts. Pettit even penned a special poem, called "Last Day in Space," to commemorate his imminent return. During their stint at the space station, Pettit, Kononenko and Kuipers also played host to the first ever visiting commercial spacecraft in May —SpaceX's Dragon capsule. The unmanned Dragon spacecraft was launched to the orbiting outpost as part of a crucial test flight to demonstrate its ability to haul cargo to and from the station. Padalka arrived at the space station in mid-May with NASA astronaut Joe Acaba and Russian cosmonaut Sergei Revin. The three will remain aboard the orbiting outpost until September. Later this month, on July 14, another Soyuz spacecraft is scheduled to launch three more crewmembers to the space station to replace the returning astronauts.